[Did you know that today is National Dog Day? For us, comfort means ensuring that our dogs only drink the cleanest water – or, in other words – drink the same quality of water as everyone else in their home. With that, we felt it was time to revisit the post below, sharing 5 reasons why Clark – pictured above – only drinks filtered water in his home. Two Christmases ago, I looked down to see my dog Clark happily chewing on a glass Christmas ornament. Just after buying a new receiver, we arrived home to find a dog-shaped bite mark taken out of the remote control. And while entertaining friends, a whole Buffalo wing apparently fell directly down Clark’s throat. For all we know, it’s still in there. I preface this post with the facts above to reiterate one basic truth known to dog owners around the world: you just can’t always control what goes in there. Dogs will swim in just about anything, eat just about anything and drink just about anything. When it comes to Clark, sniffing you out in the image above, we’d have more control if we bought a goat. And this is one of the main reasons I insist on giving my dog filtered water – nothing too fancy, just poured from a ZeroWater or a Brita – rather than water from the tap. See my all too true anecdotes above. We crate Clark during the day, not because we want to (we’d save a bit of money on our alarm system if we didn’t) – but because his unpredictability makes our home impossible to dog proof. I may not be able to control the oddball occasion of finding Clark with a mouth full of Christmas decorations or carpet samples, but I can definitely control his intake of common tap water contaminants. Our house is a classic heirloom home in south Minneapolis, built before the 1920s. The house itself is clean – but its guts show its age. Before making it into our glasses, our drinking water flows and pours through old copper pipes. And our Brita water filter pitcher will reduce up to 91% of copper contaminants. Chlorinated drinking water, to me, contains a bit of necessary chemical evil. And by all accounts, dogs can sense this touch of evil. Meares Plumbing out of Florida helps illustrate this with a recent Facebook post sharing why dogs drink water from the toilet: the longer tap water sits, the more chemicals begin to dissipate. 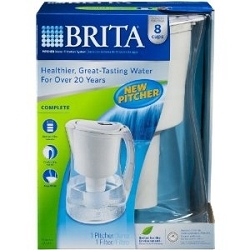 Fortunately, I can avoid time spent waiting for chemicals to flutter away and filter out a lot of chemical evil with our Brita water filter pitcher, prior to it making into any living body in our home. Toilet water is also cold – and while a dog will really drink just about anything – that smile on their face when their beverage is cooled is enough reason for me to pour from the Brita, rather than from the sink. This is a good opportunity to help further debunk the wide-held Internet belief that cold drinking water and ice can cause life-threatening bloating in dogs. Deriving from a 2007 letter from a grieving but misguided dog owner that experienced a very close call, this story has been called out as inaccurate multiple times in the ensuing years. A 2010 article by Patty Khuly, VMD, MBA even indicates the benefits of providing cold drinking water for dogs – including breaking water drinking binges. This is a very personalized reason – but Clark drinks from a vintage bone-shaped ceramic bowl. It’s slippery and awkward. The fewer times I pick it up, the fewer opportunities I will have to break it. If you insist on filtered water for your dog, I would love to hear your reasons why in a comment below. I also would encourage you to subscribe to this blog or our YouTube channel, like us on Facebook or follow us on Twitter to stay up to date on all the latest water news and hydration tips. I also invite you to +1 and add us to your circles on Google+ to be the first to learn about exclusive deals and new products. I give my dog filtered water, along with my cats, as I won’t drink from the tap, therefore, why should I make them and leave them susceptible to all the toxins in the water. I actually use a reverse osmosis water filter system for all our drinking water. I want to remove all of the contaminants, chemicals and toxins from my water to live a healthier life, and I want the same for my pets. Thanks for the post. I also give my dog filtered water, however I have noticed that for some reason he prefers to drink the water that we keep in the corner by the plants. That water is a plain tap water that has been sitting in a jug for a day or two. Any thoughts why? Post three above borrows some information from a recent Facebook post by Meares Plumbing indicating that the the longer tap water sits, the more chemicals begin to dissipate. This is one of the reasons why dogs are prone to drink water from toilets. Without knowing your personal situation, specifically the age of your filter or type of water, it’s possible that your dog is detecting something in your water that it finds distasteful – and that whatever it is detecting fades as your water sits out. I have an Aquasana under the counter water filteration system, the only thing is my drinking water is hard it does not make it soft. I did have a reverse osmosis but that adds alot of sodium to water which the sodium was affecting me so I put this new Aquasana system in. But now I am reading that hard water can cause urinary tract infections etc in dogs & cats so my question is which is the best filtered water system for my dogs? My concern is I have Aqua filter system which leaves in the magnesium and my water is hard Is hard water bad for dogs? Thank you for contacting WaterFilters.NET! I would suggest looking into a water softener for you home. In general, hard water is bad for not only dogs but humans as well. Have you had your water tested recently? Otherwise I can suggest to you a whole house system and use an Iron reduction filter to help reduce the hard water, but if your water is really bad, I would look into getting a water softener and also getting your water tested. Please let me know if you have any further questions. Thank you again and have a good day. Thanks for that Article, I thought I was the only one crazy enough to give my dog filtered water 🙂 All my friends give me the crazy look when I tell them. I feel he has a lot more energy since changing to filtered water and also some of his health issues went away after some time. We have a dog that drinks filtered water and he loves it! We have actually noticed a difference in his behavior since he started drinking filtered water. He is much happier and more active. It’s amazing what how little changes like drinking filtered water can affect him! Yes you are right, drinking filtered water is good for health though it water is drunked by human being or animal. Now a day we see, to purify water corporation uses chlorine in water which is very harmful. So purifying water is Good for health. My dog drinks filtered water too! This is great. This is pretty much interesting! The kind of water matters as well to dogs! We love our dogs as well and will now use the filtered water.